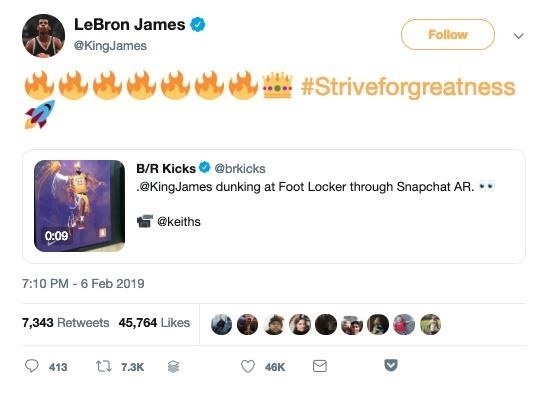 Lebron James, or King James to his royal subjects, is extending the reach of his kingdom beyond basketball and into the realm of augmented reality. 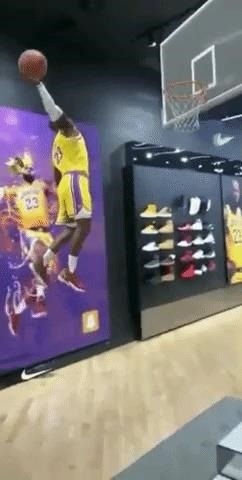 The NBA superstar, in his role as pitchman for Nike, is the centerpiece for a new in-store Snapchat AR advertisement at the House of Hoops by Foot Locker store on the Hollywood & Highland Center in Los Angeles. James shared a video of the AR experience via Twitter, garnering more than 1.25 million views through his tweet alone, according to a Snap spokesperson. 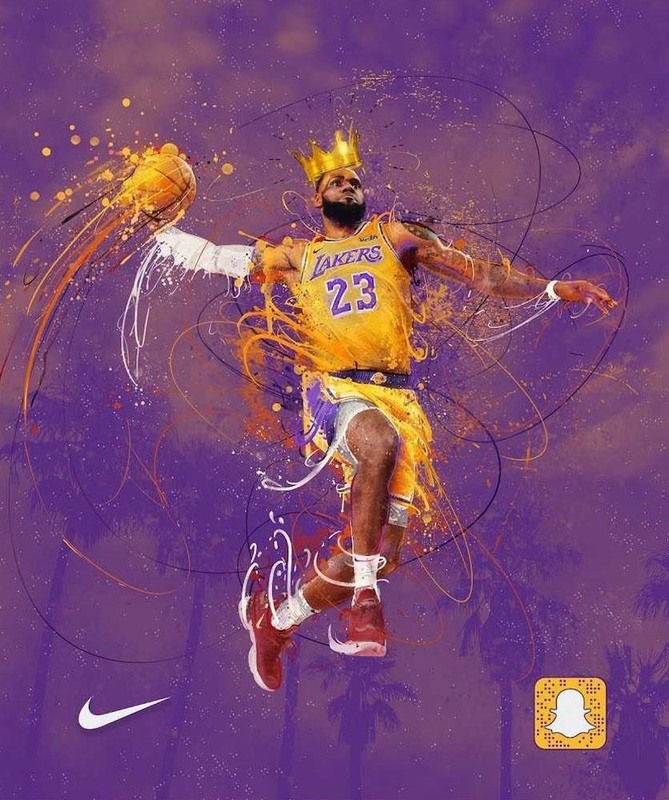 Foot Locker customers in Los Angeles can activate the experience through Snapchat by scanning the Snapcode, which brings a digital doppelganger of King James into the camera view. From there, the player appears to burst forth from the advertisement, dunking on a virtual basketball goal. 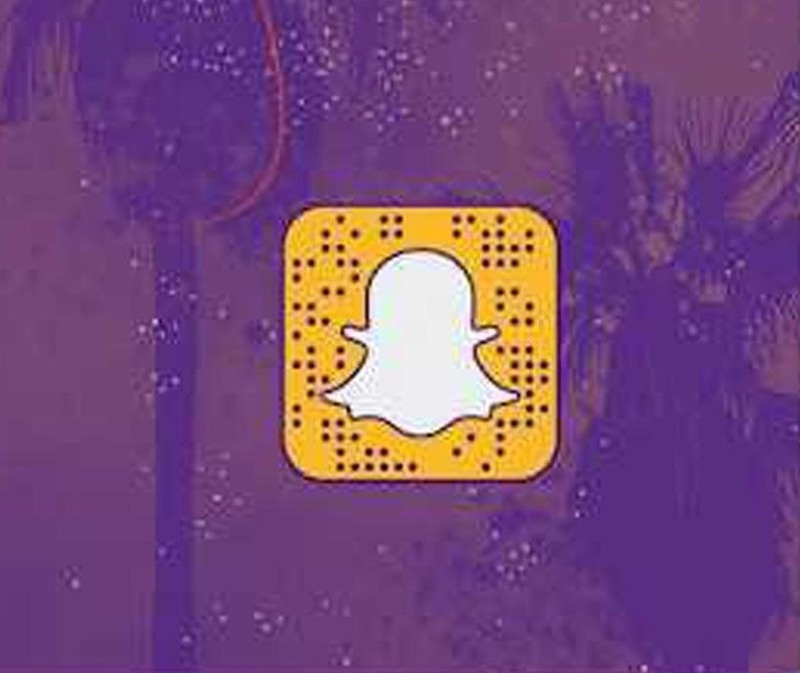 You can try it out yourself by scanning the Snapcode (below) and then pointing the camera at the Lebron James illustration (also below). Digital agency Fishermen Labs developed the experience along with Snap using Snapchat's marker-based technology, which is available through the Lens Studio platform. Augmented reality has already become a popular technology for the NBA and its teams. 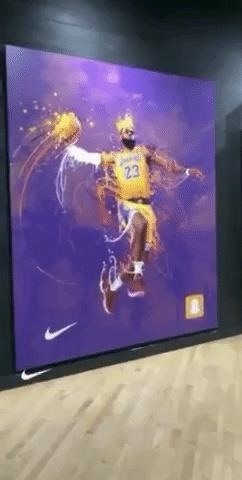 The NBA AR app was among the first ARKit apps to hit the App Store, and the league has since added more capabilities to the app and ported it to Android via the ARCore toolkit. In addition, the Dallas Mavericks, Los Angeles Clippers, and Sacramento Kings have deployed their own AR experiences. In fact, former NBA star and ever-present pitchman Shaquille O'Neal has emerged as the de facto augmented reality godfather of basketball, helping the NBA and Magic Leap introduce the NBA app for Magic Leap One and immersing himself in an on-air AR animation via his role as talking head for TNT's NBA coverage. So watch out, Shaq, because King James is mounting a challenge to your AR throne. Moreover, Snap has found a new niche in its Snapchat augmented reality offerings for brands by merging traditional and digital advertising tactics in an immersive experience. The company recently demonstrated how brands could leverage the approach with an AR billboard (less than three miles away from the Foot Locker store featuring James) to promote a Snap Original series starring entertainer Bhad Bhabie. Now that Snap has managed to stop the bleeding of users leaving Snapchat, according to the company's latest quarterly financial results, brands may find renewed trust that they can spend their advertising dollars on Snapchat and take advantage of its wide variety of mobile augmented reality experiences.